Japanese bentos are a beautiful way to express your love for your family. Tuna is full of omega-3 fatty acids and great for heart health. 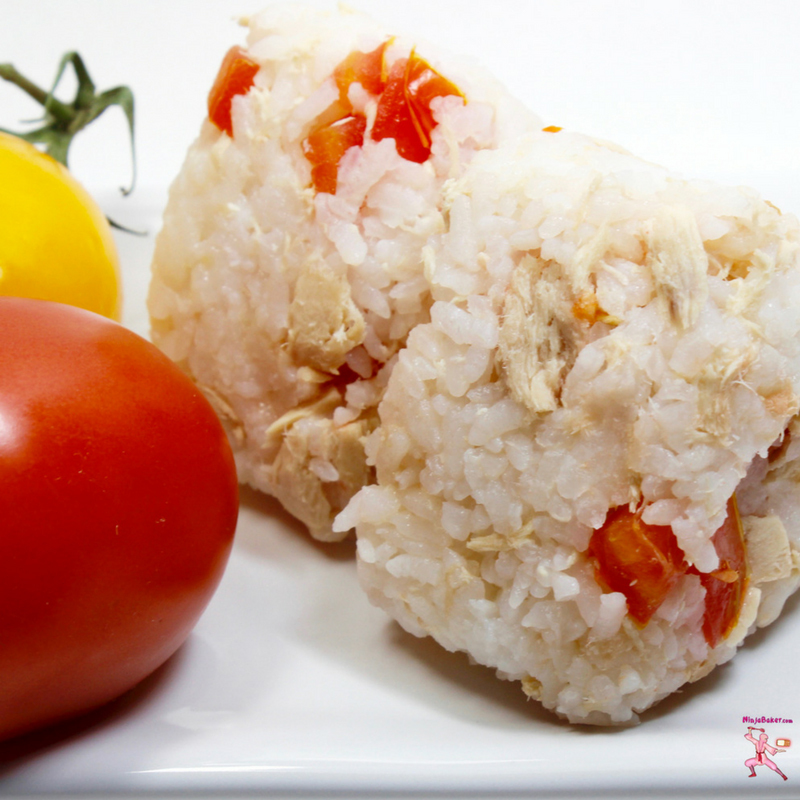 Tomatoes are chock full of vitamins A, B6, C and K. A dash of soy sauce atop this combo of tuna and tomato in sticky Japanese white rice is sublime. The tuna and soy sauce contribute salt and the tomatoes sweeten the rice. Popular in America are mayonnaise mixed sushi rolls. Feel free to add to taste. Also, if you want to add a crunchy component, try fried onions. (The kind in the can.) This tuna and tomato bento is also a great project to enjoy with children. http://ninjabaker.com/sites/default/files/tuna-and-tomato-bento-NINJABAKER-1.jpg Ingredients: 1 cup of cooked Japanese white rice (short-grain) ½ cup tuna flakes Note: I used ½ a can Chicken of the Sea Tuna contained in water. Use tuna stored in oil if you'd like a salad dressing-ish gloss on your tomatoes. 1 small Roma tomato Note: Your favorite tomato is fine. I like the Roma because its not quite as watery as other tomatoes. 1 small yellow tomato for garnish and to add to the bento box, if desired Soy sauce (or salt or mayonnaise or other favored seasoning) 2 cheese sticks, cut into bite-size pieces 1 carrot, cut into sticks Candies..and whatever else you want to add to your Japanese bento box! When Japanese TV weather reporters start their cherry blossom forecasts, you know it’s spring. Due to the diversity of temperatures in Japan, the pretty pink petals are spotted at different times. Follow the Parade of Cherry Blossom Festivals and Parties, you’ll see picnics! Who wouldn’t want to enjoy yummy treats under branches laden with pink? Truly it is like fairyland. Parks in Japan turn into magical places. You want to rush out and enjoy the delights of spring. Tuna and tomato bento boxes are the perfect solution. This Japanese bento is easy to prepare and super-nutritious. Tuna is good for the heart. Thanks to omega-3 fatty acids. Tomatoes are packed with vitamins A, B6, C and K. The best part of tuna and tomato bentos are the deliciousness. Tucked into Japanese rice, the tuna, tomato and a dash of soy sauce tickle the tongue with salty and sweet. Even if you live in Antarctica, tuna and tomato bento are a joy to make with children. Every family member can shape the tuna and tomato-laden rice into shapes and characters to their liking. Speaking of preference, I like my tuna and tomato rice balls (onigiri in Japanese) for my bento, old school. In other words, simple. Still, you can go to town adding mayonnaise, fried dried onions, pickles or even crushed potato chips! Use plastic wrap to handle warm rice. Order cute bento rice-shaping tchotchkes on line. A dash of soy sauce atop this combo of tuna and tomato in sticky Japanese white rice is sublime. The tuna and soy sauce contribute salt and the tomatoes sweeten the rice. This tuna and tomato bento is also a great project to enjoy with children. Note: I used ½ a can Chicken of the Sea Tuna contained in water. Use tuna stored in oil if you'd like a salad dressing-ish gloss on your tomatoes. Note: Your favorite tomato is fine. I like the Roma because its not quite as watery as other tomatoes. Candies..and whatever else you want to add to your Japanese bento box! Let your cooked rice cool so you can comfortably handle the grains. In a bowl combine the tuna flakes with the diced tomato and rice. Add any mix-ins: Mayo, fried dried onions, crushed Japanese rice crackers. When combined, take plastic wrap and scoop up the mixture to form triangles. Note: If you don’t use plastic wrap, you’ll need a bowl of water nearby to constantly dip into for your sticky rice covered fingers. If you like butter, you can also slightly grease your hands and handle the rice that way. You can also use a cookie cutter. Or order accessories online specifically designed for creating fun shapes with rice. 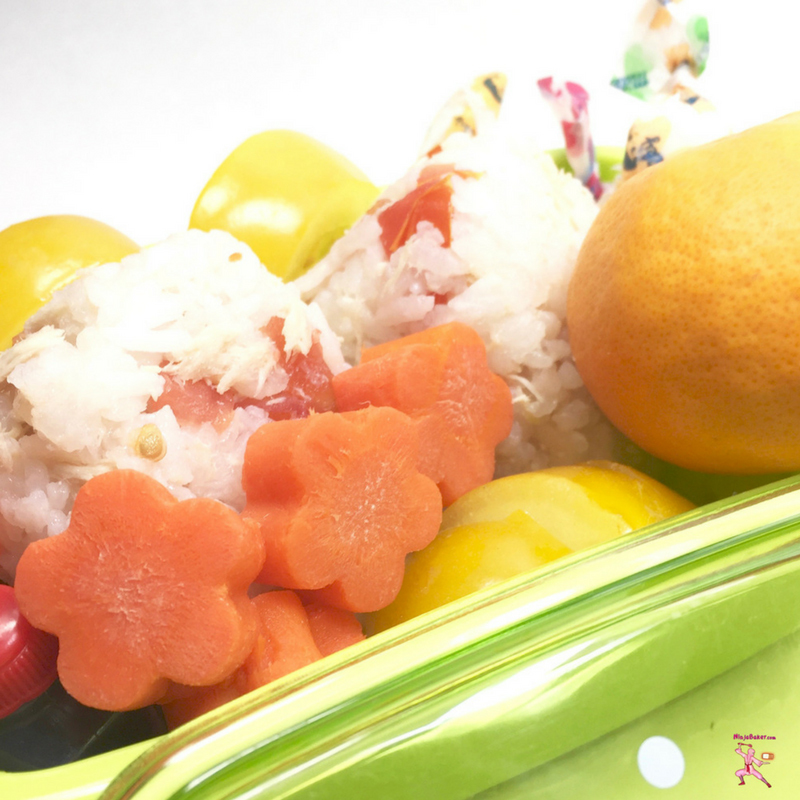 Arrange the tuna, tomato rice balls with the cheese bites, carrot sticks, candies and soy sauce into a bento box. Rini of the Healing Tomato kindly hosts today's Sunday Supper. Wishing you carefree springtime delights!